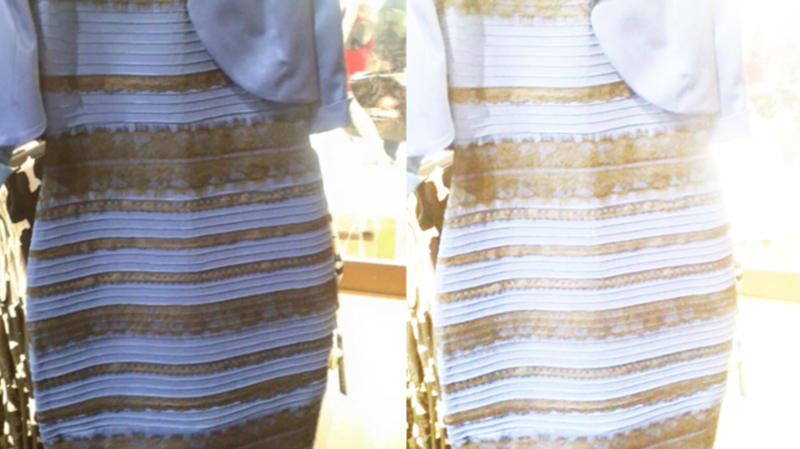 Last night a picture of a dress launched a thousand arguments. Is it black and blue, or white and gold? Some people are completely convinced it’s one or the other. Others experience a flip back and forth between the two perceptions, seemingly at random. Vision scientists, and computer graphics programs have weighed in on the controversy, but what, you ask (as you always should), do linguists have to say? Well, as it turns out, something important. Something that may unite us all. You see, all the colors in that dress go back to the same Proto-Indo-European root, *bhel-. Yes, *bhel-, which had the sense of “bright, shining” gave rise to various words for white. Blanche, blanco, and bianco in the Romance languages, belyi, bjal, and bialy in Slavic languages, blank, bleach, and pale in English. What else is bright and shining? Fire. Blaze and flame also go back to *bhel-, and what color are things have been through a blazing flame? Black. Black also goes back to *bhel-. Through the concept of brightness, *bhel- also went down various paths to emerge as blond and the Latin flavus, meaning golden yellow. And finally, blue was handed down from Old French bleu which went way back to the *bhel- of whiteness and also meant pale, wan, or bruised. If skin is pale and bruised, what color is it? Blue. So there you have it. The dress is not only an accidental exercise in the relativity of color perception, but a split mirror reflecting back to us 6000 years of language history. Black, blue? White, gold? As a matter of human cultural concept-making they are, when viewed at very long range (okay, very, very, very long range), one and the same. No need to fight about it. The dress is *bhel-.